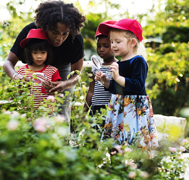 The summer months are anticipated all year round by kids everywhere, but for parents they can be one of the most stressful seasons — at least when it comes to childcare expenses. According to Statistics Canada, in Ontario, the average cost of childcare expenses is $677 per month. In Toronto, it’s even higher, averaging about $1,758 per month. Even if parents can go without childcare during the school year, that could all change in the summer. If both parents work out of the home, it’s likely not feasible to take too much time off. Some may have grandparents or other relatives who can watch the kids, but it’s not always guaranteed. And finding a daycare program or hiring a babysitter can quickly add up in costs. Go in on a nanny share. It’s likely that you’re not the only parent in your neighbourhood or social circle struggling with childcare expenses. If you can organize it, you might be able to start a babysitting group. A few families can split the cost of a summer nanny so it costs less over the summer months. Send the kids to summer camp. Summer camps can be expensive, but there are many more affordable options available, especially in the GTA. Some summer camps offer sessions for as low as $100 per month. If you’re not sure where to start looking, try asking around your neighbourhood — typically smaller, more local camps may cost less. Check with the local theatre, local museum, local municipal government, or your local school board. Summer school could also be an option. Also, ask about financial assistance. For example, at the YMCA, their day camp programs take your financial position into account. This isn’t necessarily a childcare option, but it can save you money. If your kids are going to soccer practice, summer camp, or elsewhere it might make sense to connect with a few other parents who are at the same activity and arrange ridesharing. When funds are tight, any bit of savings can help. See if you are eligible for any government assistance. In Ontario, families with children under the age of 13 can apply for the Ontario child care subsidy. Low-to-moderate income families might also be eligible for the Ontario Child Benefit. Check if there are any federal, provincial, or municipal programs available that you are eligible for. Look at a small personal loan. If you have to pay for childcare and it’s left your budget tight, you could also look at a small personal loan as a stop-gap measure. Look for one that has a fixed monthly interest rate and payment plan. This will leave you with a reasonable monthly payment that you can budget for and help you get through summer expenses. At Prudent Financial, if you have equity in your home or vehicle, we offer personal loans to people with good credit, bad credit, and everywhere in between all across Ontario. All of our loans report to the credit bureau, so you’ll even be able to rebuild credit when you go through us. Contact us today to find out more. Call 1-888-852-7647 or visit www.prudentfinancial.net.